EXPERIENCE: For almost 40 years, Triple A has maintained a "Get the job done right" reputation unequaled in the industry. PERFORMANCE: We apply state-of-the-art quality control procedures of inspection and documentation to every aspect of our work. LOCATIONS: Triple A has the largest, most multi-purpose, all weather facilities and capabilities on the West Coast. San Francisco and San Diego. COMPETITIVE: Our on time and on budget deliveries are second to none. We are equipped to handle every large or small vessel challenge using the most advanced equipment and skills in the world. VOYAGE REPAIRS: Triple A maintains, around-the-clock, a fleet of mobile equipment specializing in portable machining and boring operations. GRAVING DOCKS: We have six docks, one of which accommodates ships up to 1100 x 144 x 40 feet. And that's just in San Francisco. 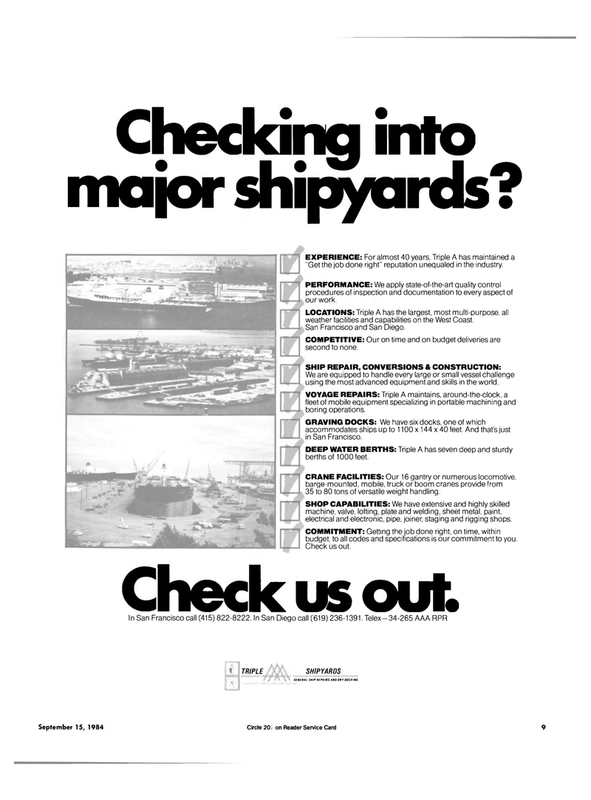 DEEP WATER BERTHS: Triple A has seven deep and sturdy berths of 1000 feet. CRANE FACILITIES: Our 16 gantry or numerous locomotive, barge-mounted, mobile, truck or boom cranes provide from 35 to 80 tons of versatile weight handling. SHOP CAPABILITIES: We have extensive and highly skilled machine, valve, lofting, plate and welding, sheet metal, paint, electrical and electronic, pipe, joiner, staging and rigging shops. COMMITMENT: Getting the job done right, on time, within budget, to all codes and specifications is our commitment to you.